Who was the first-ever Marvel character? Do you think you know? It was a superhero you may have never even heard of: Namor the Sub-Mariner, a mutant son of a sea captain and the princess of Atlantis not too dis-similar from Aquaman. Namor, the star of Marvel Comics #1, is lesser-known. That’s probably because he’s never had a film, partially due to an embroiled copyright war between Disney, Marvel, and Universal. 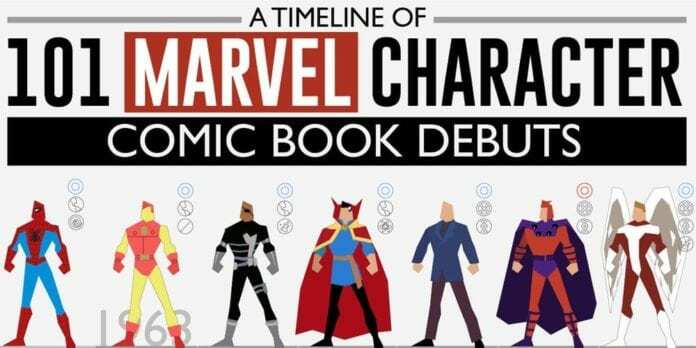 In this comprehensive look back at the debuts of 101 Marvel characters, compiled by AAA State of Play, we see how much this incredible company has changed over the past 80 years. That’s right – Marvel is having a year-long celebration of their 80th anniversary this year! Since Namor in 1939, the company has introduced hundreds of characters we love, but this short guide points out some comic classics. Did you know, for instance, that Thor, Captain America, and the Fantastic Four all pre-date Spider Man? Did you know that the crowd-favorite Deadpool is 28 years old? And Deadpool is far younger than Carol Danvers, who dates back to 1968 or Black Panther, who dates back to 1966. In this celebration and retrospective of Marvel, we can see some of the hit comic-book characters who’ve made the big screen as well as who haven’t. Fans of Miss America or Rockman, for instance, have had to wait quite a while for a film. On the other hand, X-Men like Gambit were introduced on TV not long after their comic-book debut. Newer characters, like Spectrum, Ms. Marvel, and Ironheart are already smash hits and hopefully will get their own screen appearance soon. Whether you love popular film darlings or the obscure superheros only found on the page, it can be fun to look back and see when your favorites made their debuts compared others on this list of Marvel characters. It’s amazing to see what the company has done over the past eight decades. Who knows what kind of stories they’ll be telling after 100 years? This chart was created by the AAAStateofPlay content development team, led by Kim Hart. Those who worked on it include Kim, Mitch, Joy, and Nic.